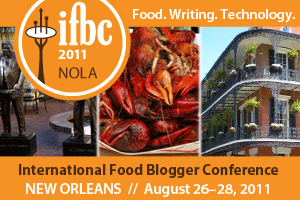 A week ago, I was very excited to be attending my first ever International Food Blogger Conference — the IFBC 2011 NOLA, put on by Foodista. I even arrived a few days early so that I could visit with friends, and we organized a Pisco and Ceviche tasting at their cafe. Only a few months ago, I celebrated the six month anniversary of Pisco Trail, so I welcomed the opportunity to meet other food writers and cooks, and to learn more about food writing and blogging in one of my favorite cities, New Orleans. The conference was held at the Monteleone Hotel in the French Quarter, walking distance to many great bars, restaurants, and music clubs. Even before arriving I had made a schedule of all the talks I wanted to attend, on topics ranging from SEO and marketing, to time management, sustainability, and food photography. We were also treated to tastings from many local restaurants and wine producers. I really enjoyed meeting other people who were enthusiastic about sharing their food — from home cooks and moms, to caterers and restauranteurs — and everyone loved learning about the unique culture of New Orleans. Instead of a business card, I carried my iPad to introduce myself via photos of my Lomo Saltado, Ceviche Nikkei, or Frejol Colado — and I was delighted that everyone oohed and aahed in response. By the end of the weekend, I was grateful to have tasted many wonderful dishes and cocktails, and to have met many passionate fellow foodies. 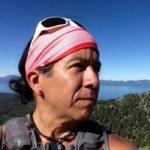 I was also inspired to promote my blog more through social media, and now you can like Pisco Trail on Facebook or follow Pisco Trail on Twitter. I could not have asked for a better first food blogging conference, and now I can’t wait for the next one!